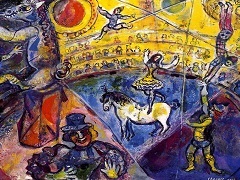 A good example of Chagall's use of this new autonomy of colour as a kind of first aid for those who view his work is The Concert, painted in 1957. A boat with a couple on board is drifting along a river, with a city on the bank to the right and a group of musicians to the left. The lovers' naked bodies are shrouded in a glowing red that extends upwards beyond their heads. Parallel to this band of colour are two other strips of blue that run from the water to the musicians. 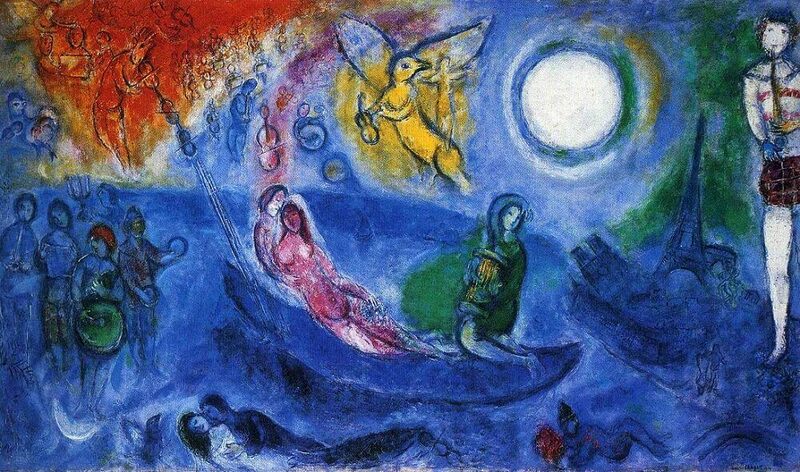 These bands suggest that the boat is moving from the bottom right to upper left; so this romantic boating trip, under a full moon, proves in fact to be a voyage from the city cloaked in cool blue to a higher sphere peopled by heavenly musicians. 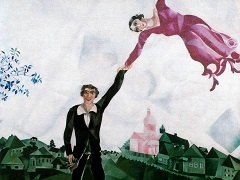 As mentioned by Marc Chagall: "God, perspective, colour, the Bible, shapes and lines, traditions, and all that is called human life - love, security, the family, school, education, the words of the prophets and life in Christ - all of it was out of joint. Maybe I too was occasionally filled with doubts. At such times I painted a topsyturvy world, took the heads off my figures, divided them up into pieces, and set them floating about in my pictures somewhere or other." 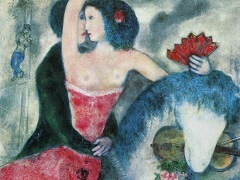 The Eiffel Tower, the Arc de Triomphe, and Notre-Dame show the city to be Paris, the city where Chagall had his atelier before the war at a time when it was still what it was no longer to be in the aftermath: a great art metropolis. 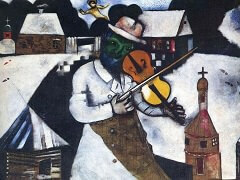 Like many fellow artists, Chagall had turned his back on Paris, and the Cite d'Azur had become a little Montpamasse. 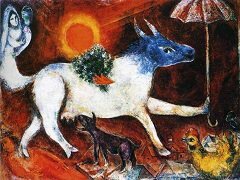 It was an apt setting for Chagall, and he was not to leave the region; indeed, in 1967 he built a house large enough for his requirements at Saint-Paul-de-Vence. 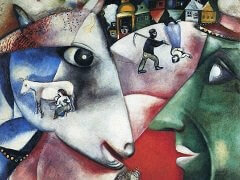 It contained three studios, one for graphic work, one for drawing, and a third for painting and large-scale designs.